Static Website Designing at Resistive Technosource is designed by our experienced designers which are highly appreciated in the market for its user-friendly design, professional look and cost-effectiveness. Site will have visually appealing, attractive, pixel perfect, professional, modern and user-friendly designs. - Unlimited revisions will be given on designs untill approved. - Fully responsive site which will auto adjust its size based on device width like mobiles/tablets/PC. A static web page is a web page that is delivered to the user exactly as stored. Static web pages are suitable for the contents that never or rarely need to be updated. These pages are often HTML. AceDesigno is an apex web site development company operating from India. Your website design plays a major role in its visitor's choice to either stick around or continue surfing. Graphics, layout, load time, fonts and ease of navigation can all influence the visitor. 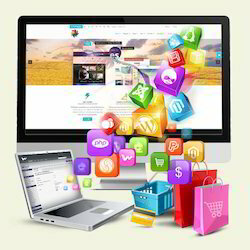 We craft the website that retains visitors, make it fast, clean, and pleasant to look at. Web designing is an art and we are the proven artists "Get the art done"
The fast pace of internet is changing the face of business today. Every firm, every business wants to be promoted on the internet prospecting higher sales and market share. This has brought out the need for website designing for these businesses.